X, T Put a charge counter on Ice Cauldron and remove a nonland card in your hand from the game. As long as that card remains removed from the game, you may play it. Note the type and amount of mana used to pay this activation cost. Play this ability only if there are no charge counters on Ice Cauldron. 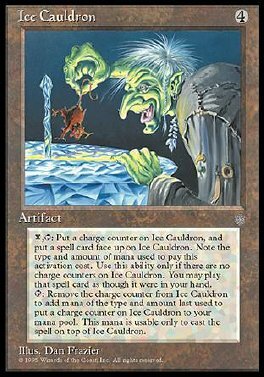 T, Remove a charge counter from Ice Cauldron: Add to your mana pool mana of the type and amount last used to put a charge counter on Ice Cauldron. Spend this mana only to play the last card removed from the game with Ice Cauldron.